Full disclosure: I got some stuff for free. Details. 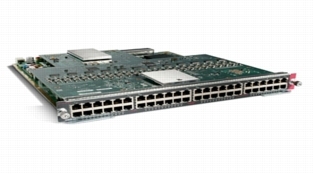 I'm not sure why, but Cisco stopped offering line cards with RJ21 interfaces. It doesn't seem like this needed to happen: 1000BASE-T requires the same type of cable (Category 5) as 100BASE-TX, and Cisco demonstrated that the port density required for 48 gigabit ports is possible. I worked in one environment where the tradition of remote patching continued on gigabit gear through the use of 25-pair cables terminated with six individual 8P8C connectors. Whenever a new switch or line card got installed, it was immediately populated with eight of these multi-headed copper cables. They terminated in a very large 110 block patch area. It worked well, but the Plug Pack is better. 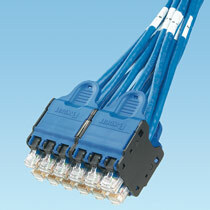 Panduit's Plug Pack modules keep your cables nicely collated, especially when a component is removed for maintenance. A squeeze of those large levers depresses each cable's retention clip, all at the same time. All of the cables maintain their relative position and can be plugged back into the switch all at once when maintenance is complete, eliminating cabling mistakes. Plug Packs can be ordered alone, or as an assembled system with the size, length, wiring, termination (of the other end) and similar details specified by the customer. I suspect that a common configuration is to order large assemblies with Plug Pack on one end and individual female jacks on the other, ready to be snapped into a patch panel. The step on the bottom of the plug mates with a step at the front edge of the Plug Pack. It prevents the cables from protruding too far. You insert a cable from the back and it clicks into place. If the Plug Pack is already installed on a switch, the cable will click into the Plug Pack and the switch port at pretty much the same instant as you push it into place. 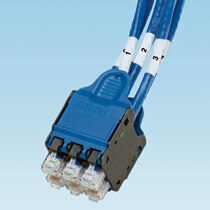 Naturally, Panduit only guarantees that their own cables will interoperate with Plug Packs. I dug around in my bin of cables, and found many that fit the Plug Pack, but not all of them. Some cables don't have that step along the bottom edge, and the strain relief on many would prevent the barb from engaging. Cables that looked like they would work, because they had the step and no boot, were all dimensioned correctly and clicked into the Plug Pack with no problem. They were fine until I tried to remove them from the assembly, when their snag-prone retaining clips became a problem. Panduit offers a couple of nifty accessories to go with the Plug Pack: a removal tool and a "locking" wedge. 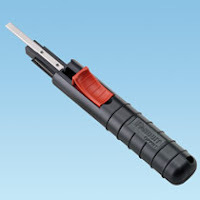 The removal tool allows for removal of an individual cable from the assembly, even while the assembly is in use, by simultaneously releasing the retention barb and depressing the lever to release the plug from the switch port. It relies on the unique anti-snag retention clip found on Panduit cable ends, and it certainly beats my chopstick! The locking wedge fits under the release lever, and can be secured with a nylon tie. It prevents the lever from being depressed, and also prevents removal of individual cables. I don't have a removal tool, nor the wedge, and have never seen either of these parts. The cables I'm using with my Plug Packs are Panduit's Small Diameter (SD) Category 6 cables. They're remarkably tiny, quite a bit smaller than any of the other Category 5 or better cable I've ever seen. Comparison of Cat6 and Cat6a Small Diameter (SD) cables vs. typical cables. While these are certainly nice cables, I'm a little fuzzy on who should be buying a Category 6 cable. What's the use case for these things? Surely nobody would buy Category 6 with TSB-155 in mind, so what's the point? For that matter, what's the point of Category 5e? Maybe there's a non-network use (video?) for these cable types. Update: 2014-02-06: I recently learned that 802.3at (PoE Plus) requires Cat5e cable. So, that explains the point of Cat5e these days. Thanks to Panduit's generosity, I'm using Plug Packs at home. My use case is probably not what was intended when the product was created, because I'm not dealing with super high density cable management. All of the major Cisco training vendors expect students to be working on a rack of equipment including four switches with 12-18 links between those switches, but they don't agree on which ports connect between the various devices. Switching from one vendor's workbook to another requires re-cabling of the switch interconnects. Before I got the Plug Packs, this was a tedious and error-prone job. Now I just pull the cables off the switches and set them aside. The Plug Packs keep my physical topology intact, even when it's not connected to the switches! 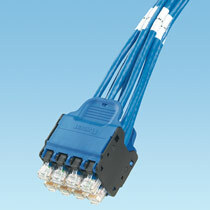 Four switches cabled up according to the IP Expert topology Click! I use different colored Plug Packs for each training vendor, so re-cabling the topology is no problem now. It only takes a few seconds to set one bundle of cable aside and snap in a new one. I liked this product based on seeing it in the catalog and on display at a trade show. Its potential for streamlining hardware maintenance and moving messy cabling away from the switch was obvious. Less obvious (until recently) was how I'd be able to use it in my lab. I wanted to blog about it, but I'd never used a Plug Pack, or even held one in my hand. So, I contacted Panduit, and asked for samples. I explained that I wanted to use Plug Packs in a personal project, and that I wanted to write about it here. I gave them my wishlist, and a few days later a box of goodies arrived. This is not the first time I've written about a Panduit product, nor is it the first time they've given me a product sample: They sent me a CDE-2 sample for one of my customers after I wrote about overheating Nexus 2xxx.